Over the course of the first year of the Trump administration, the office of Immigration and Customs Enforcement (ICE) has become greatly emboldened in their further expanding operations. Raids are becoming more brazen as police departments continue to work more with ICE officers to conduct raids and target ethnic communities. According to the Washington Post, ICE doubled its amount of noncriminal arrests in the last fiscal year, the majority of which occurred after Trump’s election. It should come as no surprise since the president ran on an demonizing immigration platform that equated illegal immigrants to rapists and drug dealers in overtly generalized terms. 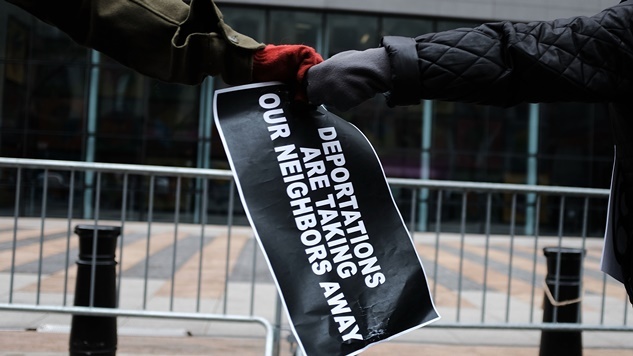 Pairing that xenophobia with the expansion and brazeness of recent ICE operations unsurprisingly breeds controversial detainment decisions and public controversies that expose issues with U.S. immigration enforcement. Here are five of the worst examples from the past month alone in ICE operations. 1. Two fathers were detained by ICE in New Jersey as they dropped off their kids for school. One of the strongest arguments against non criminal deportation is that it tears families apart in more ways than one. The case of Gunawan Liem and Roby Sanger paints a picture of how callous ICE operations have become in the face of those criticisms. According to WPIX, the two men were intercepted by ICE officers after dropping off their daughters for school. Both men have no criminal record and originally came to the U.S. to flee the persecution of Christians in their home of Indonesia. A third man, Harry Pangemanan, evaded ICE and took sanctuary in a church. Pangemanan was recently awarded for helping rebuild more than 200 homes following Hurricane Sandy. 2. A Kansas chemistry professor was arrested on his front lawn after getting his kids ready for school. Syed Ahmed Jamal came to the U.S. from Bangladesh more than thirty years ago on a student visa, holds graduate degrees in molecular biosciences and pharmaceutical engineering and regularly checked in with ICE officials to make sure his visa was current and to maintain his work permit. None of that was enough though, as ICE officials arrested Jamal on his front lawn after getting his kids ready for school. According to the Chicago Tribune, Jamal has no criminal record and works as both a researcher at local hospitals and an adjunct professor at Park University. He’s the spitting image of the “merit-based” system Trump continues to spout on about implementing to keep the criminals out of the country. Facts aside, how can Jamal’s detainment and deportation be sanctioned by an administration that truly wants the best and brightest minds? 3. A man was detained by ICE after calling 911 to report an intruder. It’s one thing to have a perfectly routine morning interrupted by an ICE raid in front of your children. It’s a completely different thing to call the police for protection and end up in jail yourself because of an unknown ICE warrant. That’s what happened when Wilson Rodriguez Macarreno of Tukwila, WA dialed 911 to report a trespasser following repeated attempts by someone to break into his home and vehicle over the past few weeks. According to CNN, Macarreno’s submitted his ID to police officers for “report purposes” and was arrested after an outstanding warrant appeared after running his name through the National Crime Information Center. The problem is that the warrant that popped up wasn’t a criminal warrant but an administrative ICE warrant. ICE warrants aren’t subjected to the same judicial oversight as criminal warrants and doesn’t require the approval of a judge. Macarreno fled violence in Honduras in 2004 and was on ICE’s radar after missing a court date in 2004 due to not having an address to receive the court order. Along with the warrant issue, Macarreno’s case could deter immigrant populations from calling the police when needed and further breeds distrust for the police among minority populations. 4. An illegal immigrant married to a U.S. citizen was detained while seeking legal residency. Fabiano de Oliveira came to the U.S. from Brazil in 2005 illegally, and met his wife, Karah, in 2010. The two were married in 2016 and the Oliveiras went to the U.S. Citizenship and Immigration Services office to begin the process of determining their marriage was lawful. This first step toward permanent residency for Oliveira was interrupted when ICE agents detained him as they were being interviewed, the Boston Herald reports. It marks the return of an aggressive tactic that wasn’t utilized under the Obama administration. Under Obama, measures were taken to keep families together as non-citizens married to citizens applied for green cards, but it seems as if those pairings will be viewed as marriage fraud before an investigation can even begin. Oliveira was the third non-citizen spouse of a citizen to be detained in this fashion in January. 5. An asylum seeker was arrested by ICE at his own asylum hearing. The American cultural shift has empowered ICE agents to begin running operations in locations normally viewed as too sensitive. The practice of apprehending illegal aliens as they seek citizenship was common a decade ago though. Now, ICE officials are detaining asylum seekers during their asylum interviews. According to Splinter, Sudanese asylum seeker Omer Abdelmaed was arrested moments after his asylum interview at the San Francisco U.S. Citizenship and Immigration Services office. ICE officials said Abdelmaed’s arrest was related to a violation of the terms of a temporary visa by him. During his interview, Abdelmaed requested asylum as he opposed the ruling party in Sudan and would be subject to persecution upon his return. The arrest was only the second of its kind after a Venezuelan man was arrested in Florida under similar circumstances last April. He was ultimately released after Sen. Marco Rubio intervened. Abdelmaed’s lawyer, Caleb Arring, suspects his client was detained because Abdelmaed’s home country, Sudan, was included in Trump’s travel ban. ICE spokesperson James Schwab also stated that Abdelmaed was “wanted for criminal charges by law enforcement in the United Arab Emirates.” No further clarification on such charges was given. Abdelmaed left a wife and child in the UAE, but none of his family was aware of criminal charges.